After winning in overtime last night against the Cleveland Cavaliers “B” squad, combined with the Bulls losing to Toronto, yourrrr Seventy Sixers clinched the Eastern Conference’s six seed and a first round match up with the Orlando Magic. The Sixers lost all three matchups versus the Magic this season and going into this series, there isn’t much that indicates the Sixers have a chance. But I feel the Sixers could make a series out of this. I’m not calling an upset, cause of seven words; Samuel Dalembert will be covering Dwight Howard, so unless Howard can do us a favor and get Dalembert into foul trouble early, he should dominate from opening tip of game 1 through the entire series, and he will be the deciding factor. But with the return of Thaddeus Young to the lineup for the final two games will help him get his rhythm going into the playoffs and he will provide a boost and a spark that was missing during his injury. The Sixers will steal a couple games and make it a series, but I’ll take the Magic in 6. With the 5th seed in sight, the Sixers took on the Minnesota Timberwolves last night at the Wach. DEspite only scoring 37 points in the first half and finding themselves down by 6 at the break, the Sixers were able to take control in the 4th and ride the young buck, Thaddeus Young to victory. A tale of two halves if you will. 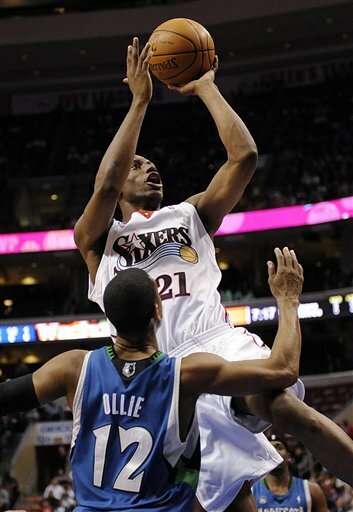 Young scored 29 points and Andre Miller had 15 to lead the 76ers to a 96-88 win over the revamped Timberwolves on Wednesday night. Revamped meaning that Kevin McHale decided it would be a good idea to get some of his bench guys a start. He sat the entire starting 5 and went with an unusual starting five in; Brian Cardinal, Rodney Carney, Craig Smith, Kevin Ollie, and Bobby Brown. With the win the Sixers (37-33) pulled within a half-game of the Miami Heat in the Eastern Conference standings. The Heat lost 90-88 at Indiana on Wednesday.